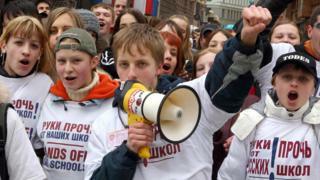 Russian MPs have urged their government to impose economic sanctions on Latvia, where the Latvian language will be made compulsory in all secondary schools. The language reform is being phased in; by September 2021 all 16 to 18-year-olds will be taught only in Latvian. More than a quarter of Latvia's 2.2m people are ethnic Russians, most of whom are taught in Russian. However, the only official language is Latvian. Russia has long accused EU member Latvia of undermining minority rights. Tensions have been simmering for years, partly because Latvia and its Baltic neighbours Estonia and Lithuania are Nato members. During the Cold War they were under communist rule from Moscow. The drive to make Latvian the only language in secondary education will begin next year. Bilingual or Russian-only teaching will continue for younger children whose mother tongue is Russian. According to 2016 data from the Latvian government, 811 Latvian schools are state-funded, including 94 schools where the teaching is in Russian or bilingual. Latvian President Raimonds Vejonis said the language reform would improve equal opportunities for all citizens. "It will make society more cohesive and the state stronger," he said. In response, the Russian Duma (lower house) resolution called it a violation of internationally recognised rights. The MPs, overwhelmingly supporters of President Vladimir Putin, said sanctions on Latvia could include restrictions on trade and financial operations, a boycott of some goods and measures targeting individual Latvian politicians. Russia has already banned food and drink imports from EU countries because of Western sanctions triggered by Russia's intervention in Ukraine. Last month the Russian foreign ministry called the Latvian reform "odious" and "part of the discriminatory policy of the forceful assimilation of Russian-speaking people that has been conducted for the past 25 years". The Latvian government says ethnic minorities will still be able to study their own cultures and learn in their mother tongue in primary school. The Russian minority is much larger than Latvia's other minorities, such as the Poles. Around 300,000 Russian-speakers, or 13% of Latvia's population, are so-called "non-citizens". Fluency in Latvian is among the requirements for Latvian citizenship. In Ukraine in 2014 Russian-speakers' fears that their language rights were at risk fuelled the ethnic conflict, in which Russia annexed Crimea and helped insurgents in the Donbass region.